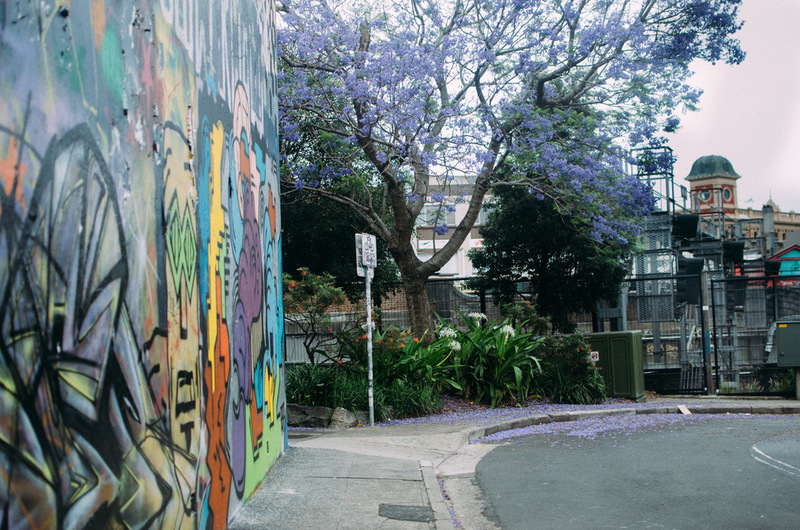 Culture Scouts is the brainchild of Art Pharmacy's founder, Emilya Colliver, and Melinda Vassalo (author of Street Art of the Inner West). It has a number of tours on offer that highlight either street art or hidden galleries - all with a sprinkling of the best craft beer and/or coffee available in that area. The tour I did was based in Newtown. With Melinda Vassalo as the guide, we all met at Newtown station, grabbed a coffee and followed her into the laneway world of the inner west. It didn't take long to realise that Melinda knew her stuff. She spoke about street art with passion and understanding. For those of us who didn't really have an opinion on this sub-culture, her knowledge and simple way of communicating helped us to form an understanding of this art-form that's splattered across hundreds of urban buildings and infrastructure. Like the Street Art itself, Melinda had an attractive edginess about her - streetwise, been there done that, colourful, embracing life and with a strong belief that we all have things to say and express and that the streets are a great platform to do this. What really blew me away was the amount of street art that's only meters from the main drag (also only meters from the local Police station) - it's everywhere. There's also a plethora of styles and subjects to experience - some are the size of a piece of bread, some take up the entire wall of a three story building, some are legal, some are not, some political, some humorous, some are for a cause, some aren't. There are even memorials to artists that have died on the job - drowned in storm water pipes or hit by trains. The tales seem endless. At the end of the tour we got to have a refreshing craft beer or cider at Young Henry's which you have to see to believe. Young Henry's is a craft beer brewery hidden away in the backstreets of Newtown - large industrial stainless steel tanks are the backdrop for this inner citer watering hole. And If you're not a resident of the inner city, like me, you'd never even know that such a place existed. This is not only a great way to end the tour but it also gives you time to initiate conversation with your co-participants or ponder and consider the last couple of hours of your life. I think, what really made it for me was that it allowed me to venture into a world that not even all the locals would necessarily know about. It was a true cultural experience; it was at ground level and urban. I can't think of a better way to get a rush or hit based on a theme that is so dear to my heart - ART! - Street Art is a genre where birth names aren't used as it is generally against the law. - Some stretches of walls are owned by street gangs and it's only their members that can paint on it - if a non-member paints on it, they have stepped across the line and should watch their back. - For street artists who use aerosol cans, the nibs are like their paintbrushes - very important - different types are used to create different styles. Melinda knew of artists that had gold plated their favourite nibs and wore them as jewellery. - The actual street pavement is sometimes used as a palette for the artist - testing nibs, stencils and mixing of colours. - When the word 'toy' has been written over someone's work it means that the work has no street cred - weak, insipid. Like all interests in life, street art has its own jargon - yarn bombing, paste ups, tags, stickers, gorilla knitting, throw ups, chroming and the brown belt - I'll leave it up to you to find out what these mean - a Culture Scouts tour has the answers.